Things have been rough for the Philadelphia Phillies as of late. After winning six straight the club is now riding a streak in the opposite direction, having lost five straight and eight of its last nine. The club aims to turn things around Sunday afternoon and salvage a win against the Washington Nationals in the final contest of a three-game series. 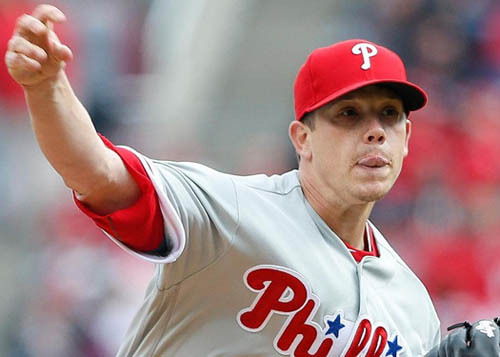 Jeremy Hellickson (4-1, 3.18) hopes to rebound from his worst start of the season last week where he surrendered eight hits and six runs over four innings in a loss to the Chicago Cubs. He's performed well over his career at Citizens Bank Park, pitching to a 1.66 ERA over his last eight starts at home. Opponents have hit just .178 against him during that span. The Nationals counter Hellickson with Tanner Roark. The righty tossed a career-high 125 pitches over six innings during his last start, surrendering six hits and four runs to the Arizona Diamondbacks. For his career he's 5-5 with a 3.49 in 13 games against the Phillies. Cesar Hernandez recorded his 14th multi-hit game of the season in last night's 6-2 loss. He's now tied with Washington's Daniel Murphy for second-most in the National League, trailing only Ryan Zimmerman. Hernandez is making quite a name for himself this season. Entering Sunday he leads all second basemen in WAR (1.5), third in batting average (.339), and fourth in RC+ (136).